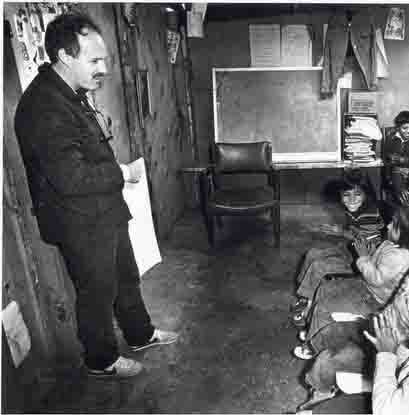 Armando and the Blue Tarp School authors Edith Hope Fine and Judith Pinkerton Josephson tell the story of teacher David Lynch and the birth of his school that serves children who live in a settlement near the Tijuana municipal dump. This year is the book's tenth anniversary so I asked Judith Josephson, author of many children's books, about the story behind this book's creation. LS: The creation of the book Armando and the Blue Tarp School has its own history. How did you first get involved with the story? JJ: Edith Fine and I were doing feature articles for the Los Angeles Times when it had an office in San Diego. 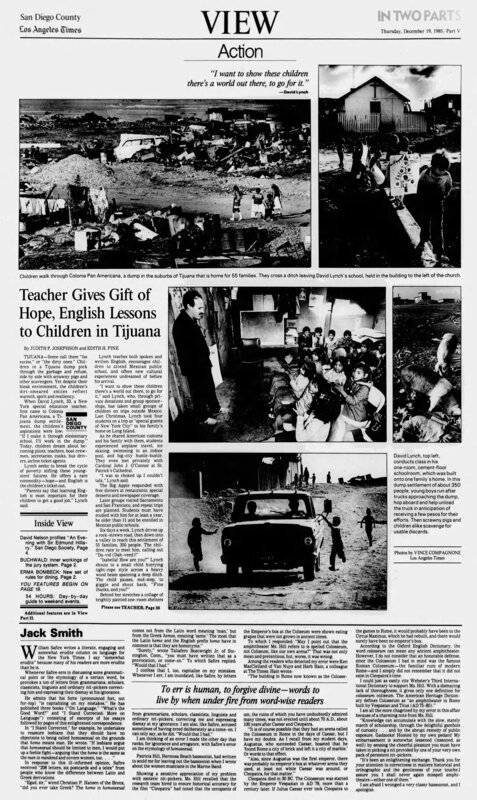 Through my daughter’s Girl Scout Project, which I was in charge of, I learned about a teacher named David Lynch who had established a school held on a blue tarp in a settlement near the Tijuana municipal dump. The more Edith and I learned about his endeavor, the more we felt it was a story that needed to be told. Given the go-head by the Los Angeles Times, we journeyed to the site with a photographer. Gathered on the blue tarp, the children were so eager to learn, most having had no schooling before David arrived. On that cold December day, David Lynch pulled out jars of paint. Painting was new to most of the youngsters. They relished the texture and scent of the paint, filling their papers with bright colors. We couldn’t help but be touched by their eager, open faces. After our article appeared, our editor at the newspaper called with the news than an anonymous reader had donated money to build a school. For the residents of the colonia, having a school of their own had been a dream. At last they had the funds to buy construction materials. Dump residents did the work themselves. We made several visits to the dump in the process of doing the initial newspaper article and the follow-up once the building was finished, and we couldn’t get the children we’d met out of our minds—the little girl rummaging in the garbage alongside a pig, and her excitement at finding an egg for her family; watching the children painting the first time; the boys and girls working alongside their parents tearing apart plastic bags in the dump; their elation on the first day of school in the new building. We created a composite character based on the children we had met. But we were thinking of Felipe, the boy of nine who came to David’s blue tarp. His parents and grandmother all worked with him in the dump. Felipe persevered with his education and is now the principal of David’s school in Tijuana. His children have gone on to be top students in their classes in school. We made the book’s Armando have a love for art because so many in the settlement did what they could to find beauty in their drab surroundings. 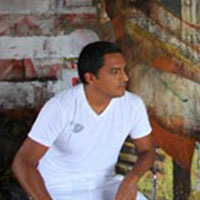 LS: Did you know illustrator Hernan Sosa or meet him during the process of creating this picture book? JJ: No, we didn’t know illustrator Hernan Sosa before the book. The publisher chose him, as is most often the case, unless the illustrator is also a writer. But we did send him the many photographs we had taken in the dump settlement and he used them as models to create the beautiful illustrations. that at the time we first learned about David Lynch, chickens, pigs, an occasional cow, and dogs roamed through the settlement, some even hovering near the blue tarp. So Hernan added a character to the book, a dog that appears whenever our main character Armando appears. LS: Why is David Lynch's story important to you? JJ: Because of David Lynch and his charity, Responsibility, thousands of children have been educated. They know that learning can change their lives. They dream of careers as lawyers, computer technicians, teachers, artists, doctors, and more. David tells them, “The decisions are yours. They are your responsibility.” Besides his 39 years teaching the children of Tijuana, he's provided schooling for a decade to children (and adults) at the municipal dump of Matagalpa, Nicaragua. 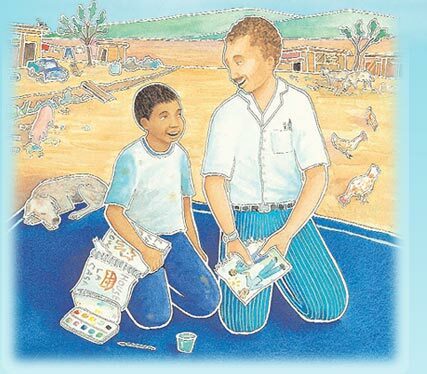 On his first visit there, he found another teacher who also had spread a blue tarp on the ground in a dump settlement. 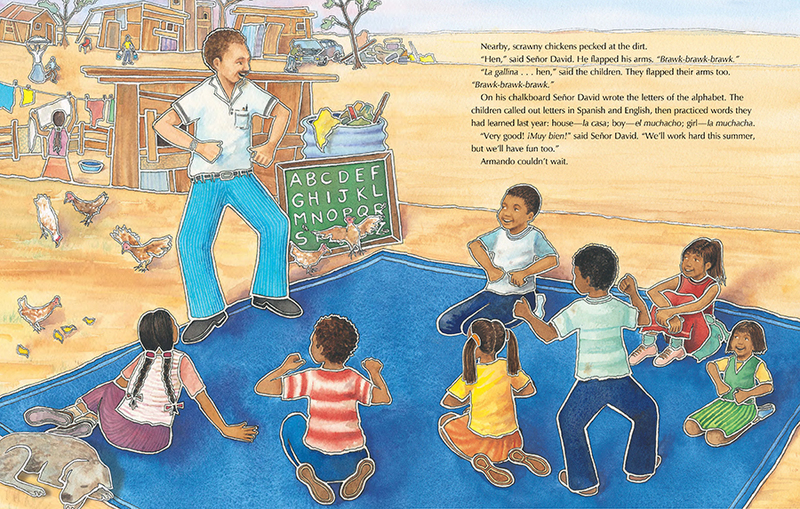 His organization is helping bring education and clean water to the children in that settlement. Among his numerous honors are a United Nations Humanitarian award. LS: Have you thought about writing a sequel to the book? JJ: A sequel is a tempting idea. Worldwide, some fifteen million people live adjacent to garbage dumps, so the concept still resounds. So much has happened since we first met David. Our book has been translated into Spanish, been chosen as the 2012 One Book One San Diego selection, plus we’ve visited many schools and talked to students about Armando. In 2010, the book was made into a children’s musical produced by the Park Dale Players, raising $10,000 for Responsibility, David Lynch’s charity. On April 12 and 13, 2019, it will be performed again by a new group of student actors to benefit Responsibility. Los Angeles Times article in this blogpost is reprinted with permission from the Los Angeles Times.